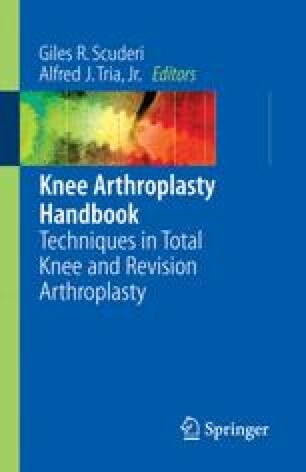 Instruments for total knee arthroplasty continue to be refined. Most systems develop the implants and the instruments at the same time with two different teams leading the investigations. There is no question that the more accurate the surgery performed, the better the result and longevity of the prosthesis. At the present time, extramedullary tibial jigs, intramedullary femoral jigs, and patellar resurfacing with reference to the original thickness represent the standard. Instruments for the flexion and extension balancing are still in their infancy. The references and landmarks for the instruments will probably change over the next few years; however, the principle will remain the same.